How have I missed out on Robert Goddard's British thrillers until now? 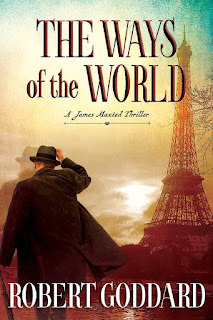 His website proclaims him "master of the clever twist," and Grove Atlantic released today his 24th book -- and the first in a World War I-era trilogy: THE WAYS OF THE WORLD. Max Maxted -- well, his family calls him James, but everyone else uses Max -- was a flying ace during the Great War, and finished the conflict as a prisoner of war. He's still very reactive to enclosed spaces, especially damp, dark ones. But with the enthusiastic partnership of his former sergeant Sam, who still refers to him as the lieutenant, Max is about to put his Flying Ace skills to glorious work: starting his own flying school in green and peaceful England. Or he was. Because at the start of THE WAYS OF THE WORLD, Max's cleverer-than-she-looks mother has just tracked him to a hangar of aircraft he plans to purchase. And with one blunt announcement, she turns his priorities her way: "It's your father, James," said Lady Maxted. "He's been killed, I'm afraid." There's no reason to think the death is anything other than an unfortunate -- perhaps embarrassing -- accident. After all, Sir Henry Maxted, 2nd Baronet, had a long diplomatic career most definitely on the wane after the war, and his "work" in Paris was probably just a formality, a chance to put an old man out on display for something not very important. Max and, especially, his older brother Ashley know that; so does Lady Maxted. "I know I can rely on him to protect your father's memory at all costs. Whereas you ..."
"Will go in search of the truth . . . wherever it is to be found. ... All I ask is this: if you discover your father was the victim of something other than an accident and if you discover what that something was ..."
"I should like to hear of it before you proclaim it to the world." Max felt the full force of his mother's gaze as he stood before her. What Max would never have guessed was that his mother didn't just suspect her husband of a routine French affaire. She's the one who senses that he's been up to more than a routine diplomatic mission, too. But as Max begins to peel back the layers of his complicated father's life abroad, first he gets in trouble with the French police himself. Then he finds the deep waters of espionage, intrigue, and criminal enterprise. The old diplomat was doing all this? Max doesn't have time to marvel much -- he's running too hard to catch up, in terms of expertise, daring, investigation skills, and a quickly rising awareness of danger and risk that makes him very glad his sergeant Sam turns up in time to help out. It's hard not to race into this book as a reader, too: Goddard's clearly at the top of his form, writing swift action scenes and intense character-changing conflicts. 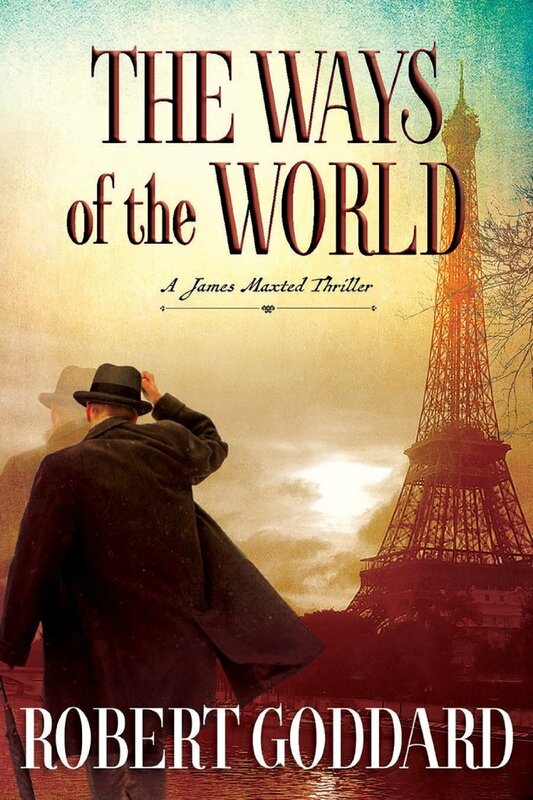 THE WAYS OF THE WORLD is a prime page-turner. Released in the United Kingdom in 2013, it's a new release today for American readers. I'm hoping Globe Atlantic will provide the second book of the trilogy quickly, as The Corners of the Globe is already in print across the ocean. Good reading! And for me, good to know there are also 23 other Robert Goddard thrillers to track down while I'm waiting for the next installment of Max Maxted's death-defying investigation! Mark Pryor's French mystery series, featuring U.S. Embassy security pro Hugo Marston, tackles the worst nightmare of any parent of a teen or young adult who heads for Europe: When your child stops answering the cell phone, how soon should you panic, who should you call, and how will you convince the police in another country (and language) that you know your grown child has not taken a vacation from being in touch with you -- something dangerous and frightening has happened to him ... or, in THE RELUCTANT MATADOR, to her. This time it's young Amy Dreiss who should be meeting Hugo for an American-style breakfast in Paris, Hugo's rare chance to catch up on real pancakes. But the young woman doesn't turn up, doesn't even call. Hugo's not inclined to panic -- his job in Embassy security in Paris has shown him the many ways a young tourist can forget to stay in touch with her parents' friends, even for a meal. Besides, Hugo has his hands full, acting "in loco parentis" to his good friend Tom, an American "spook" who stays with Hugo in Paris when possible. Looks like Tom's been on another bender, and this time he's hit a policewoman. How far should Hugo go, to bail him out? Will any of his scolding actually get Tom to stay sober long enough to partner in security and investigations? There's no time to test this, because a panicked call from young Amy's dad sends Hugo racing for to track down Amy. And the only way to keep an eye on Tom and keep him off the bottle is to take him along: first to Amy's empty apartment, then to search for the Spanish man who might have offered Amy a "modeling" job. Uh-oh. "Field trip?" Tom said hopefully. "We don't know she's there for sure, or where in Spain if she is. ... We can take a local field trip." "The club where Amy met this Spanish dude." "No idea, but it's in Pigalle." "I don't know if that's a good idea," Tom said. They both knew that Pigalle had two faces, the saucy, playful one that showed in the day, and the darker, raunchier one that emerged at night. Any club out there was likely to dangle temptations in front of Tom that he didn't need. "You know the name of the place, I assume?" Tom asked. "Club Caterina. Familiar with it?" "No. But I can't remember half the places I've gotten wasted in." "Well then," said Hugo. "We'll just have to behave ourselves and hope they don't remember you." Turns out that's not the problem -- the real complication is, Amy didn't just visit that bar, with its brass dance poles and sleazy ambience, trolling for modeling work. Umm ... she danced there. Taking her clothes off for every work shift. Soon enough, Hugo and Tom figure out that Amy must be in Spain with "that dude." Of her own free will? Or absconded and pressed into prostitution or other sleazy efforts? 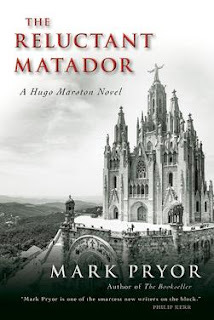 As the risks pile up -- maybe a ring of kidnappers serving the hot market in young American flesh, or worse -- the investigators race to Barcelona and immediately rub the Spanish police the wrong way, slowing their race to save Amy and turning up a dead young woman. Is it Amy? If not, where is she, and how fast can they find her, before terrible things happen? Mark Pryor's series featuring Hugo Marston is a great way to armchair-explore Europe; his earlier four titles have covered a lot of ground in France, both urban and rural, as well as some diversions elsewhere. This plunge into Spanish policing and culture adds fresh spice to the series -- this is the fifth book, and no, you don't need to read the others before this one. But I've enjoyed them all. Pryor walks the fine line of a traditional crime investigation without extremes of gore, adding just enough reality of the evil and losses that deadly crimes bring with them. And Marston is in some ways an "amateur sleuth" because his U.S. Embassy work isn't supposed to put him into a police role -- but in other ways he's a seasoned pro with an FBI past and a grasp of how to work with other police forces. keeps the details well grounded, and the pace and twists of THE RELUCTANT MATADOR are tight and engaging. Best of all, he provides memorable investigators worth following: not just Tom's efforts to get sober and do the dark work around Hugo's careful diplomacy, but also Hugo's own personality, determined to save, rescue, coordinate ... but also very worried about his love life, uncertain of how to woo or win the smart and elegant woman who's captured his attention. Add a fiercely competent Barcelona investigator to the blend, and the action never stops. Risk, danger, and fast thinking -- and oh yes, that diplomacy that Hugo is supposed to have mastered, they all are needed if Amy is to have a chance at surviving her mistakes. From Seventh Street Books, which has developed a really good line of crime fiction: check it out. And here's Mark Pryor's website, also worth a visit. Thirty-somethings today hold 9-11-2001 as their mark in time: the date the world changed. And it did for an older generation too, but it wasn't the first time. There was President Kennedy's murder - a date when the romance of Camelot fled from the image of American politics. Later would come the violent deaths of Robert Kennedy and Martin Luther King. Marks on the timeline in terms of saving the world came, too -- like the date the Berlin Wall finally stopped dividing the two halves of Germany, and the Iron Curtain that hung across all of Europe finally seemed destined to fall. June 2 marks the American release of INNOCENCE, OR MURDER ON STEEP STREET, a 1985 crime novel written by Czech memoirist and translator Heda Margolius Kovály. At the time it was first published (in Czech), the book was considered so subversive -- set in 1952 Czechoslovakia and baring the gray horrors of Soviet-style life in that nation trapped behind the "Iron Curtain" -- that its publication took place in Germany instead. The author didn't want it to create extra trouble for her friends still living in Prague at the time, and she kept the book's profile so low that it was considered obscure. Flash forward to today, as Soho Crime publisher Juliet Grames and Kovály's son Ivan Margolius -- with translator Alex Zucker -- finally release, with great satisfaction, INNOCENCE to American readers. What if Raymond Chandler's earliest work had hidden all this time? Would mystery writing be the same? How would the noir genre have risen without it? 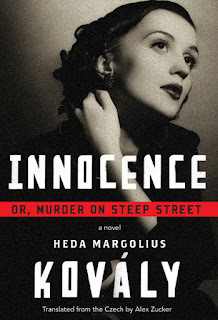 Step through the looking-glass as a woman, with a finger on the pulse of Europe, and you have the effect of Kovály's novel: Here is where we begin to face the world as it is, the the fierce appetite of crime and murder, which devour goodness and crack open the polite, the gentle, the kind. The innocent. Helena Nováková is working as an usher at a movie palace, the Horizon. Her life's stripped of all graces: Through her own offhand suggestion of a kindness to a friend, she tumbled her husband into a political black hole, and he's serving probable life in jail. She's numb, impoverished. Barely scraping by in a Czech culture of comrades and corruption. And almost without a will of her own. Slowly, around her, the facade of civilization crumbles, one person at a time. As INNOCENCE opens, Helena is doing an errand for the absent "manager" of the Horizon: telling the projectionist that his error of the day before won't be tolerated if it ever happens again. Soon afterward, the projectionist is arrested, and the investigation that uncovers his victim also begins to push Helena toward taking action that she hopes will restore her husband's freedom, or at least his culture. But instead, like the supposed dominoes of Communist occupation that once pushed America into the Vietnam war, Helena's fellow employees and even the Horizon patrons turn out to be involved in crime and corruption themselves. And -- what added trouble is Helena bringing upon herself? The translation by Alex Zucker catches exactly the trembling grim aura that I recall from the 1960s in junior high school, learning about the fervent passion of the Communist promise while also sampling Russian literature and its despair. At some moments I almost felt the red paper covers of the first Communist propaganda booklet I ever read; at others, I could have been rediscovering the madness and menace of Bulgakov's crime novel The Master and Margarita, without any redeeming magic. Here are the roots of Eastern Europe's turmoil - the same ones that Alan Furst entwines in his Eastern European crime fiction that takes place in the 1930s. There was a world war between the 1930s and the 1952 scenes of INNOCENCE -- but in some ways it only justified the bitter changes that continued to twist once-civil, once-cultured nations into a mockery of Marx's own promises. Helena's unthinking efforts to improve her situation lead into a compelling sequence of memorable scenes and taut suspense. No car chases, no gunfights, but the grit and betrayal of espionage are here, along with its pained consequences. I didn't always appreciate Zucker's choice of slang for the Czech characters -- Helena and her husband had been "hitched" for two years when their lives imploded, and Helena reflects on her own actions, "If only I'd kept my trap shut." It's jarring at first. But the match to both Chandler and the American radio shows of the 1950s eventually won over, and I felt like an investigator myself, seeking the truth behind the performances at the unfortunate Horizon. Does Helena deserve the consequences she reaps? Pick up a copy of this unusual and engrossing mystery, the only one that Kovály wrote. Let me know if you feel the same way about it, after reading it and stepping away far enough to look again: I'm shelving my copy next to Chandler. The 15th Loon Lake, Wisconsin, mystery from Victoria Houston is a satisfying traditional mystery with the flair of Houston's now well-developed characters: Police Chief Lew (Lewellyn) Ferris, who enjoys the community collaboration of her job; Lew's close (yes, very close) friend and fellow fly-fisherman Doc Osborne, a retired dentist who fills in as a death examiner for Lew's team; and the inimitable Ray Pradt, angler and, despite his fish-shaped hat and endless jokes, a magnet for smart savvy women visiting the region (and he's an excellent tracker, too). As in many of the other books in this series, solving the crime draws on the skills of each of these investigators. Look especially for fishing aspects in DEAD RAPUNZEL, because the title has nothing to do with the long-haired girl in the tower -- the Wilcox Rapunzel Olive is the rather unusual name of an elegant hand-tied fishing fly, pictured below, and the victim who's murdered in the first chapter is herself an angler and ties flies. She's Rudd Tomlinson, a wealthy widow about to open a prestigious museum as a gift to her part of rural Wisconsin. When she's pushed under a logging truck (eww! ), the icy weather can't keep Lew and Doc from tracking the killer. The main problem is, so many people have motives for this one! And although the investigation quickly eliminates Rudd's dear friend Judith (also a fly-fisher), plenty of family malice, financial gain, and a lust for power and control mean that half a dozen others are "on the hook," so to speak. Like a muskie fisherman with a lunker on the line, he couldn't help being interested in how this scenario would play out. Sloane, however confident she might be in her attempt to sneak something out of her stepmother's home, had two formidable foes: Lew had the authority of the law while Judith was angered by the attempted theft, which she was not hesitant to block. "Sloane," said Judith, her voice even, "I don't think you are aware that Rudd was killed in a traffic accident this morning. I'm sorry you have to hear it this way, but I hope that explains why Chief Ferris and Dr. Osborne are here. "Thing is, her death may not have been an accident. The driver of the truck that hit her has sworn that he saw someone -- a man -- push her. If that's true, she was murdered." Winter in Wisconsin is no time for fly-fishing, despite the book's title (which in this case refers to some flies in a display case at the victim's home), but Ray Pradt's willing moves, taking Judith ice-fishing, will break open the investigation as the pair of anglers discovers a new range of motives. There's plenty of Wisconsin in here, along with a healthy dose of fishing, but best of all there's a nicely braided murder investigation that gradually ramps up the tension, until even Chief Ferris herself is in danger. Houston's 15th is an enjoyable traditional-form mystery; the ice and snow imagery may transport you this summer to a very different season, and the human longings and well-played friendships in DEAD RAPUNZEL can fit quite nicely into the summer reading stack. 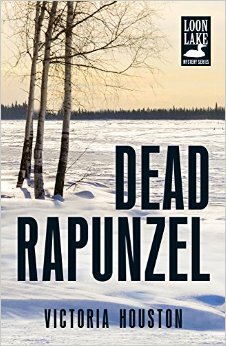 Pick this one up especially if you enjoy regional mysteries like those of Archer Mayor and Craig Johnson, and for any collection that's covering a range of American states. Fun reading, and it will stand up nicely to a second reading as well.